Wet Shave Club is a new way to help men get their shave on. 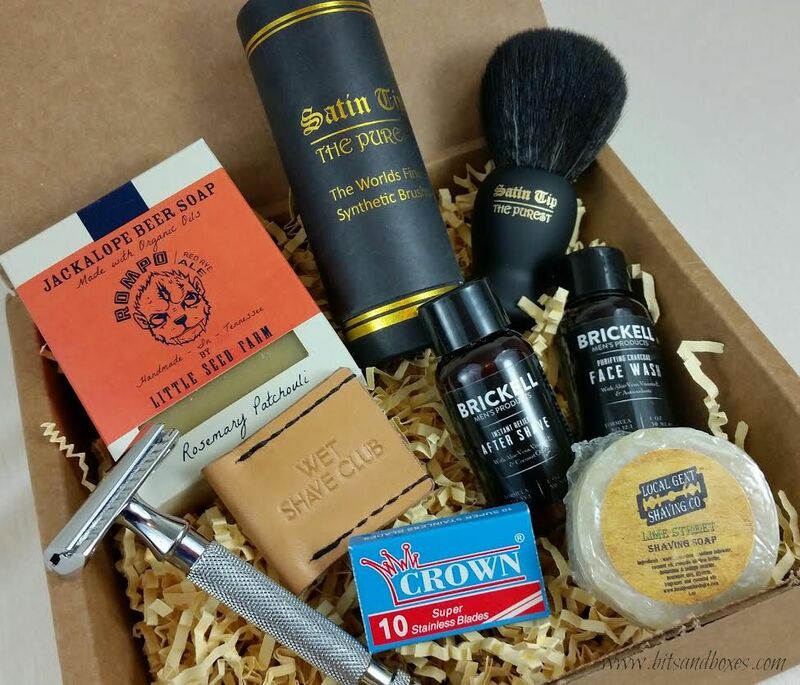 Every month, you'll get a box with all the accouterments needed for a great wet shave. If you are new to wet shaving you have the option to add a Wet Shave Club safety razor and/or a shaving brush to your first months box. If you subscribe for six months or longer, you'll receive the safety razor and shaving brush free in your first box. This review includes the safety razor and the brush. Otherwise, you'll get bottles of aftershave in manly scents, shaving pucks, soaps, face washes and whatever else they find to put in each month. My husband has found he gets the best, closest shave when he uses this wet shave method. He doesn't do it every day because it does take a little more time and care than just swiping a disposable razor across your face. If you're super new to wet shaving, check out this tutorial and/or this list of things not to do. What You Get: Each monthly box contains razors, wet shave soaps, aftershaves, styptic matches, and mystery items that you will be pleasantly surprised with. Wet Shave Club Razor- This is a heavy duty razor and means serious business. It comes with a leather cuff so you can leave it without accidentally slicing your finger on when digging around on your counter. Changing the blades is very easily done by unscrewing the top. One of the things I really like about this particular razor is the textured handle. It makes for good gripping even when your hands may be wet and/or foam covered. This razor is not cheap but you will find that good safety razors aren't. You're going to spend at least $30 on a good razor and if you don't have one you might as well just add this to your first box. You can add this razor and the Satin Tip brush to your first box for $45. Crown Razor Blades- You'll get a new box of blades every single month so don't shave with a dull blade. Just change it! These are super cheap to buy on your own, too, so if you use them faster than average, buy some off Amazon or something. Don't shave with a dull razor. There's no reason to. 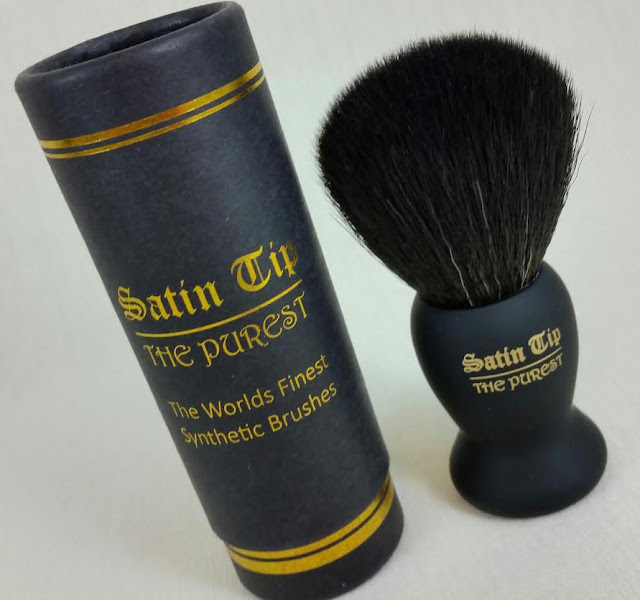 Satin Tip The Purist Shave Brush- This is a super soft shaving brush. The synthetic hairs are supposed to be even better than boar bristles. It does give nice thick lather with a shaving soap. It's easy to use and easy to wash. It also has a sort of rubbery coating on the handle that makes it easy to grip when lathering up the soap puck. 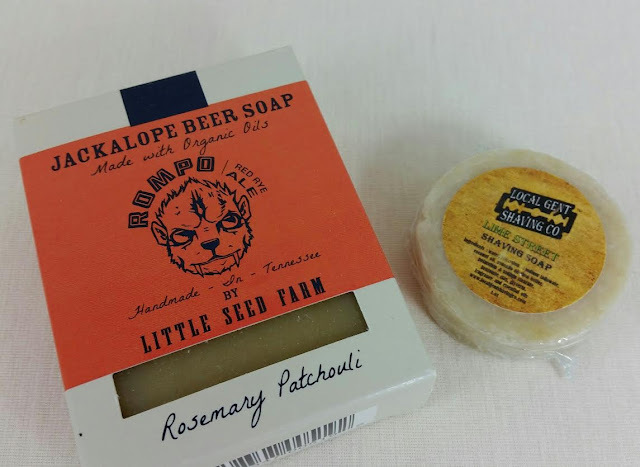 Little Seed Farm Jackalope Beer Soap- This is made using Rompo Red Rye Ale from Jackalope Brewery and raw goat's milk. It doesn't smell like beer though. It smells like rosemary and patchouli. Patchouli is not my favorite scent but my husband really likes this. Brickell Men's Products After Shave- This is nice! It smells good (like lemongrass and peppermint... MMMM!) and it has aloe, coconut oil and hyaluronic acid in it to help alleviate redness, hydrate the skin and keep irritation away. I would definitely buy this if my husband likes it. 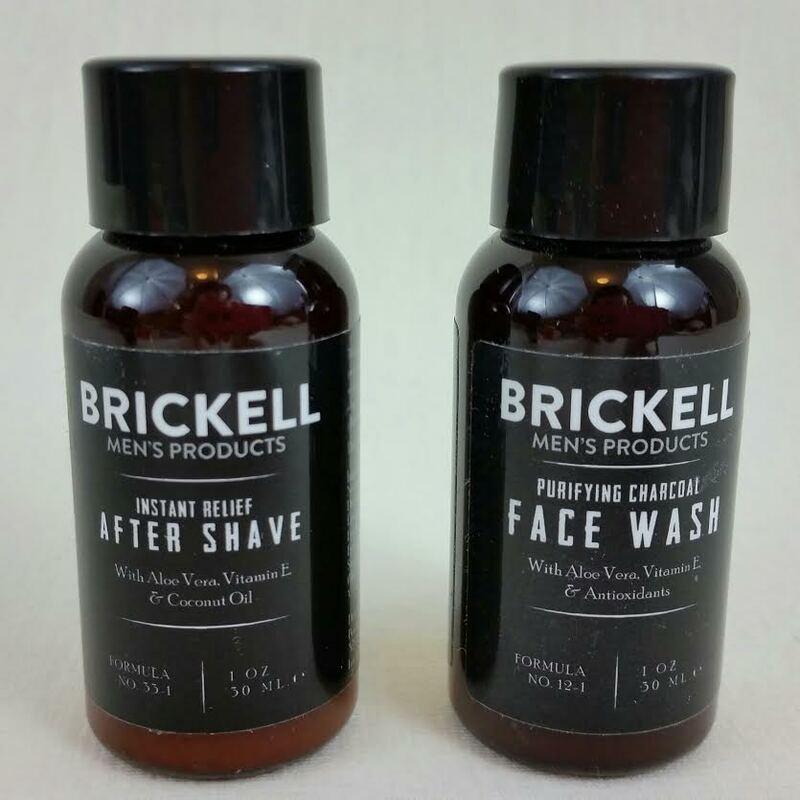 Brickell Men's Products Face Wash- This rich, foaming gel that washes away dirt and oil with coconut based cleansers. This wash also has aloe in it, along with vitamin E and antioxidants. It smells kinda like tea to me. Maybe it's the geranium? Smells manly and fresh. VERDICT: Wet Shave Club is a great way to get a continual rotation of curated men's products. Since they started, it looks like some things have changed. Now, if you are subscribing month-to-month, you'll need to add on the shaver and brush. If you buy a 6 month or longer subscription those two items will be added free to your first box. If you already have those things, you'll get men's grooming and shaving products of various types and styles. I'll be honest, I have never received a regular monthly Wet Shave Club box. When I subscribed for myself, I just got the first one and it was so much stuff there was no way I could use it up in a month. Back then they didn't have the "Skip" option. Now, however, they do and you can skip a month from your account. That makes this subscription even more attractive. In your first box from Wet Shave Club you will receive a luxurious shaving soap (scents and brands vary), 10 blades from our current selection, one of our awesome aftershaves to keep your skin smooth and fresh, a few other grooming extras, and some instructional cards to help with the process. Subsequent boxes will include aftershaves, soap, blades, and more. 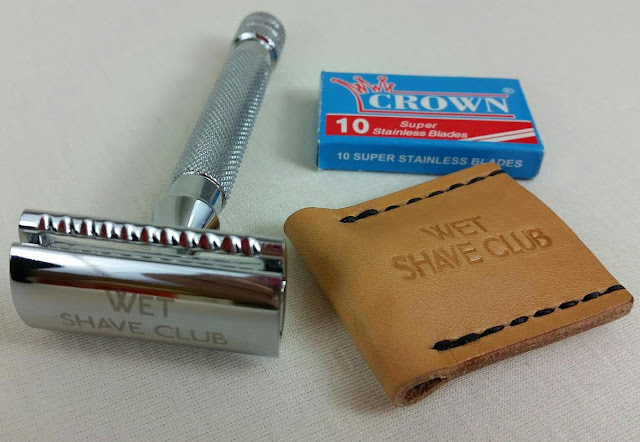 If you would like to sign up for Wet Shave Club, you can do that here. Don't forget these make excellent gifts. You can gift a 3 month subscription and the recipient will receive everything they need, including the safety razor and brush, to get a great shave. Use code BITSANDBOXES10 to get $10 off your first box! Ships to Canada for $5.99 and worldwide for $13.99. *This box was sent to me for review purposes. All opinions are mine and I do think this would make a fantastic gift (I'm probably going to be gifting a 3 month sub). Affiliate links were used in this post.